Are you having trouble lowering your cholesterol? If so, lowering cholesterol may have more to it than simply cutting down on your ice cream consumption and switching to fat-free mayonnaise. There are several risk factors that lead to the elevated levels of bad cholesterol that are so harmful to your health. The majority of people can lower cholesterol by becoming aware of the risk factors and taking small steps that lead to big results. It just might make the difference in whether or not you will be stricken unhealthy cholesterol levels that can eventually lead to heart disease. The main risk factors that work against you in lowering cholesterol levels are: age, gender, diet, heredity, and certain medical conditions. While younger men are more prone to unhealthy cholesterol levels, as women age they become equally at risk. An unhealthy diet, one that is high in fat and does not contain enough fiber, will also lead to increases. Those with medical conditions such as hypothyroidism and type II diabetes may also see increases in LDL (bad) cholesterol. Another category of risk includes environmental circumstances such as stress and smoking. The good news however, is that through diet and exercise, lowering cholesterol is achievable even if you have a family history of high cholesterol. A good diet that also contains a few choice supplements will help lower cholesterol the natural way. 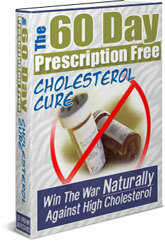 You can, through simple life style changes, be well on your way to a medication-free approach to lowering cholesterol.